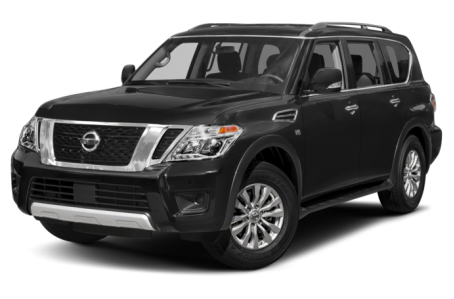 The 2019 Nissan Armada is a full-size SUV that seats up to eight passengers across three rows. Maximum cargo capacity is 95.4 cubic feet with the rear seat folded down. Three trims are available: SV, SL, and Platinum. It is powered by a 390-hp, 5.6-liter V-8 engine mated to a seven-speed automatic transmission that produces 401 pounds-feet of torque. Rear-wheel drive comes standard, while four-wheel drive is available. Maximum towing is 8,500 pounds.